FO: Lace Socks | Stitch, Brinn, Stitch! Mods: Well, the pattern is written fully, but it is presented as a lace panel you can also throw into whatever socks you want, so that’s what I did. I took my usual 54 stitch toe-up sock with garter stitch short row heel and threw some lace on top. So I like these socks. They’re taller than I normally knit them because I split the yarn into two balls with my mother’s sort of reliable kitchen scale. They weren’t even, but I started with the smaller ball and knit until I was sick of knitting it (which was before the yarn ran out). I like ’em. They fit well. The yarn stretched out a little by the end of the day when I wore them (Wednesday, in case you were wondering), but once I throw them in the washer and dryer, they’ll be good as new again. It’s the bamboo. That stuff stretches. Currently, I am knitting a couple of things. I’m knitting some dino mittens on commission (more on that later) and some more socks. I started Viper Pilots! 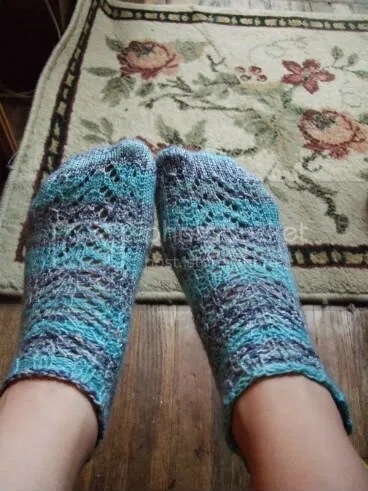 Well, I had started them before then proceeded to knit the chart upside down, so I frogged and knit something less complicated (the socks on this post here). But I’m starting them again. And they’re going to be awesome. I like your socks, but I had to laugh when you said they were tall than most that you wear. I was going to say they were a little short. Go figure. I love the pattern and the color.